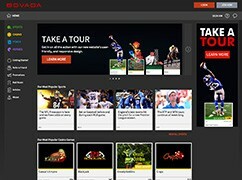 Bovada is a large online sportsbook that is exclusive to American bettors. Their sister site, Bodog, was a large sports betting site in North America and had been attempting to break into other markets. Bodog now only accepts Canadian residents. The odds on these two sites will be identical and their sportsbooks are both targeted towards North American bettors. Bovada, along with BetOnline and 5Dimes, are our recommended sportsbooks that accept American players. Bovada has become a well known brand in the United States and also boasts the biggest poker room available online for American players. The Bovada sportsbook is very easy to navigate, they offer some great features such as live betting and mobile betting that most would say are superior to the other sportsbooks that accept Americans. Overall, if you live in the United States you should have a Bovada account. Click here to check out Bovada.lv for yourself. Bovada offers new players a 50% welcome bonus. This bonus should appear in your account within 30 minutes of making your first deposit. Use Bovada referral code 3178530 when opening an account to ensure you receive the bonus. The bonus + free bet amount must be rolled over 5 times in the sportsbook. If you make a withdrawal before meeting the rollover conditions the bonus funds, as well as any money earned with the bonus will be forfeit. Basically, just make sure that you have rolled over the funds enough times before making your first withdrawal. Every Tuesday after you will receive up to 5% back on your Racebook wagers just for betting the horses through Bovada. On straight wagers you will receive 3% back and on exotic wagers you will receive a 5% rebate. A one-time rollover is required on all rebates before you can withdraw. You should also note that any horse bets placed in the sportsbook are not eligible for this racebook promotion. If you bet $20 or more on sports and $20 or more at the casino in the same weekend you will receive a $5 casino bonus chip on Monday. You must opt in to this promotion to receive the bonus. Bovada does a lot of these types of promotions that encourage players to play at the casino, poker room and sportsbook. Click here to check out some of the different promotions I didn’t get into on this page. This is where you will find the limited time promotions for Bovada that I’ve wrote about. Bovada does offer more extensive lines on the North American sports such as football, basketball, baseball, hockey, soccer, UFC, tennis and horse racing. That said, Bovada does offer a wide variety of lines in other sports as well such as golf, boxing, motor sports, rugby, cricket, darts, snooker, and more, including several entertainment lines. Unlike many of the other sportsbooks reviewed here at Bet On It Bovada.lv is not primarily focused on sports betting, but also takes their casino and poker business very seriously as well. Bovada runs a stand alone poker room that is the largest poker network currently online for American players. The casino room is also one of the best you will find online, and Bovada will constantly be trying to get you to try it out by offering promotions that link sports betting and casino, like the Weekend Combo promo outlined above. 24 hour phone support (1-888-263-0000), email (service@bovada.lv) and extensive an FAQ.